A North Carolina State University chemist has found a way to give DNA-based computing better control over logic operations. His work could lead to interfacing DNA-based computing with traditional silicon-based computing. The idea of using DNA molecules to perform computations is not new; scientists have been working on it for over a decade. DNA has the ability to store much more data than conventional silicon-based computers, as well as the potential to perform calculations in a biological environment — inside a live cell, for example. But the technology is still limited in terms of the ability to control when and where particular computations occur. 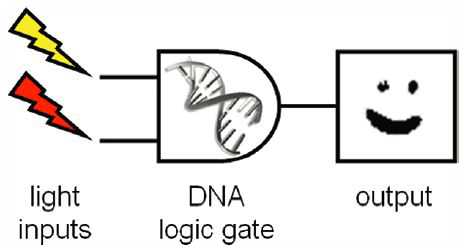 In DNA computing, logic gates are created by combining different strands of DNA, rather than by a series of transistors. The drawback is that DNA computation events normally take place in a test tube, where the sequence of computation events cannot be easily controlled with spatial and temporal resolution. So no one can tell them when or where to work, making it difficult to create sequences of computational events. Dr. Alex Deiters, associate professor of chemistry at NC State, developed a method for controlling a logic gate (for adding, subtracting, etc.) within a DNA-based computing system. 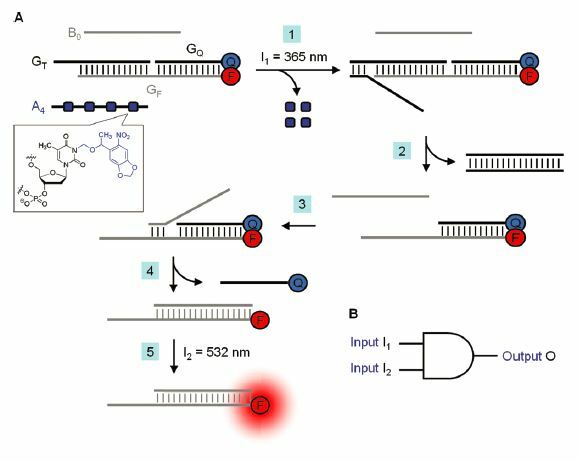 He addressed the control problem by making portions of the input strands of DNA logic gates photoactivatable — controllable by ultraviolet (UV) light. The process is known as photocaging. Deiters successfully photocaged several different nucleotides on a DNA logic gate known as an AND gate. When UV light was applied to the gate, it was activated and completed its computational event, showing that photoactivatable logic gates offer an effective solution to the “when and where” issues of DNA-based logic gate control.